Nine years after the death of folk guitar legend Elizabeth Cotten, her music is still heard everywhere--from Peter, Paul and Mary to The Grateful Dead, movie soundtracks and even the jukebox band on PBS' Shining Time Station. Cotten, who began her public career at the age of 68, became a key figure in the folk revival of the 60's, a National Heritage Fellow and a Grammy-winning recording artist. "Libba" Cotten asked the world to remember her in this way. "I want to tell them about my music. Tell them that I'm a good woman and tell them that's where they will find me...right up the ladder (in heaven.)" Turning her instruments upside-down to play them left-handed, so that she played the treble strings with her thumb and the bass strings with her other fingers, she developed a truly distinctive guitar style and sound. Her song, Freight Train, is a fingerpicker's classic, and her arrangements of tunes like Oh, Babe, It Ain't No Lie, are staples of her folk repertoire. Elizabeth Cotten was born into the Nevilles family on January 5 in 1895, near Chapel Hill, North Carolina. Her parents couldn't agree on a name, so, she was called "Little Sis," "Babe," and "Shug," until her first day of school, when she announced that her name was now Elizabeth. At the age of seven, she would steal into her brother's room while he was at work and play his homemade banjo. Broken strings betrayed her borrowing, but, even though her brother complained about it, he never scolded her or forbade her to play the instrument. Cotten tried to learn with the banjo re-strung for a left-handed player but eventually returned to her upside down method and proceeded to learn on her own. Later, she delighted her audiences with her standard declaration, "Nobody did teach me, everything I know, I learned all by myself, so, I give myself all of the credit. Soon, Cotten's brother grew up and left home, taking his banjo with him. Desperate to get her hands on an instrument, Cotten went door to door looking for work. She earned enough money to buy her first guitar, a Stella. "From that day on, nobody had no peace in that house.," she'd say with a laugh. Cotten mastered the guitar and at about the age of 12 composed her most famous song, Freight Train. Influencing the guitarists of the time--parlor guitar players, traveling musicians, medicine and minstrel showmen, and local musical stylists--Cotten developed an extensive repertoire of standards, dance tunes, and rags. Her music included original compositions, instrumental and vocal tunes, and arrangements of others' music. Dana Klipp, one of her guitar accompanists in later years, explains, "Although influenced by others that she had heard, Elizabeth was a true, original source, going back to the turn of the century. She was a link to that authentic style. Being one of the discoveries during one of the folk boom of the 1950's, she was able to leave behind a great recorded documentation of her playing style." Cotten's music, he says, was "often labeled as blues but had more ragtime influence...Her style of playing left-handed on a right-handed guitar was unique, producing a sound unlike anything a right-handed player could simulate. This technique gives her music a softer, almost classical sound. A combination of her unparalleled technique and her custom of using light strings contributed to the sound." Cotten married at 15 and eventually gave birth to her only child, Lillie. At this time in her life, Cotten added religious songs to her ever-increasing repertoire. The church was a great source of joy and comfort to her all of her life, but there was one hitch: the deacons of her church told her that she must give up her "worldly music." After learning many "church songs," as she called them, and finding that they were no substitute for the other music she loved, Cotten set her guitar aside for nearly forty years. Over the next few decades, Cotten often worked as a domestic in Chapel Hill, New York, and Washington, D.C. Some time later, when she was earning her living selling dolls in Landsburgh's Department Store, she discovered a lost child, Peggy Seeger, and returned her to her mother, Ruth Crawford Seeger. The two womem became fast friends, with Cotten ultimately going to work for the Seegers at the job that proved to be the turning point of her life. From 1945 until the early 50's, Cotten kept her musical gifts to herself. Dana Klipp sets up the famous story. "The Seegers were musicologists, and Ruth was already the author of a well-known children's songbook. The older brother, Pete, was probably already heavily entrenched. Elizabeth, who hadn't played music for years and years, picked up one of the guitars around the house." "Peggy was learning to play," recalls Mike Seeger, "and it was Peggy who discovered Elizabeth playing." Cotten was in the right place at the right time, with a house full of musicians on fire for folk music, and the Seegers swept "Libba" (Penny Seeger's nickname for her) into their musical circle. As Klipp says, "She was the folklorist's dream: a true, authentic musician." Mike Seeger began recording Cotten in 1952 and produced her first album in 1957, now re-titled Freight Train and other North Carolina Folk Songs and Tunes. " Mike said that I was good enough to perform," Cotten said in an interview, and in 1960, at the age of 68, her public career was launched. Cotten and Seeger performed their first concerts at Swarthmore College and went on to play clubs and festivals. Freight Train had become famous, but for all of the wrong reasons. Peggy Seeger had gone to England in the mid-50's and was performing Cotten's song. It was picked up and recorded by Nancy Whiskey, but, credit for the song was given to the two men who persuaded Peggy to sing into their tape recorder. Confusion mounted when Freight Train became a hit in the United States for Rusty Draper. Cotten began hearing it on the radio and thought, "Hmmmmm." "Pete heard it," Mike Seeger says, "interested a publisher, there were lawyers...Elizabeth was given-third of the credit for Freight Train which she graciously accepted. Later, Peter, Paul and Mary recorded it, and Peter Yarrow called and asked to give full credit for the song to Elizabeth, even though they had added something. That was very nice." In 1963, Cotten was on the bill at the first Philadelphia Folk Festival and in 1964 played the Newport Folk Festival. From there, she played her own concerts, and in 1967, when she was in her mid-70s, she recorded Elizabeth Cotten, Volume 2: Shake Sugaree, followed by Volume 3: When I'm Gone. Cotten and Seeger continued to perform together, and at the age of 85, Cotten appeared with her family at the bicentennial activities in Washington, D.C. In 1979, recordings of her concerts began to be compiled for Elizabeth Cotten, Live! which won the Grammy for Best Ethnic or Traditional Recording. Cotten and her daughter Lillie moved to Syracuse, New York. Now in her 90's, her hands were becoming weak and she had trouble with the guitar. Dana Klipp, a friend who was well-acquainted with her style, began to play with her in 1984. Klipp had been arranging and composing with traditional folk artist Johnine Rankin, Cotten's granddaughter, and eventually, the three of them evolved into a trio. Dan Ward, Coordinator of folk art study for the cultural resources council in Syracuse, describes their work. "Elizabeth was very spontaneous and audience-sensitive. No matter what Elizabeth did, [Klipp] picked it up and carried it, sometimes songs that he'd never heard that she was remembering from her childhood. "Her Cotten picking was a fairly distinctive style that caught on during the folk revival of the 60's," Ward adds. "Dana was not hired just as a musician. Translating her upside-down, left-handed playing, he was a second pair of hands to her and is probably the carrier of her guitar style." "I was an accompanist." Klipp explains. "Most of the time she would be playing and I would softly play with her, just to strengthen the sound of the bass lines and give her some support. "She was pretty feisty, she had spirit ...that's what kept her going. Her hands became a problem, but, she wanted to play--she loved to play. She seemed to feel she owed it to her fans, although it was difficult for her to believe that people would make such a fuss over her--the fact that she was doing something that came so naturally for her and she enjoyed doing. She was very unselfish about it. It would have been easier for her to stay home, you know. It's not like there was anything left to do that she hadn't already done." 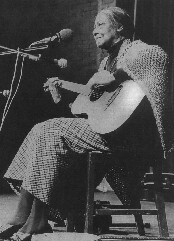 Cotten played her last Philadelphia Folk Festival in 1986 and her final concert, a tribute to her arranged by her peers at City College in Harlem, on February 22, 1987. She died on June 29th of the same year. Mike Seeger, Cotten's most frequent accompanist over the years, is still in awe of how fate unfolded before him. "Who would have known that my mother and Elizabeth, both musicians, would have met in a department store. I think that after a couple of minutes, they recognized each other. For her to come into our house, and at that time, when recorded documentation was just beginning..."
"I miss her," said former manager John Ullman. "She was a brilliant woman." When asked what he would like to say about Elizabeth Cotten, Mike Seeger answered, "In a word: grace." Many a new guitarist will still carefully pick out Freight Train as Dana Klipp and other musicians continue to pass the musical legacy on to their students. "She was an inspiration," Klipp says, "She endured and overcame hardships to share her music. Here, she had gone so many years and given music up when it was the one thing she loved to do in life the most. She suffered righteous indignation that she would play 'that worldly music.' I think she decided that if she was playing the music she loved to play, it was by no means sinful." When asked if Cotten imparted any wisdom to him, Klipp laughs. "Yeah. She said, 'If you're up there playing, don't ever stop. Even if you make a mistake, keep on goin', cause no one will ever know!'"